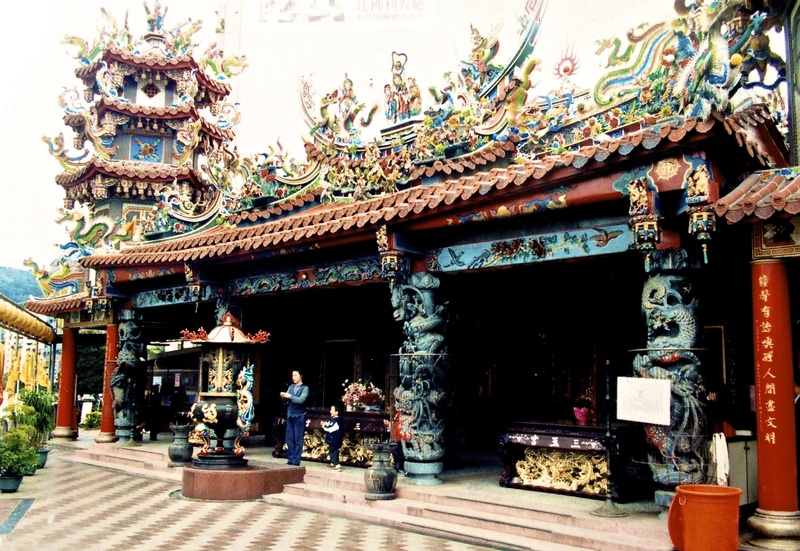 Our family lived in Taipei, Taiwan for twelve years, from 1993-2005. 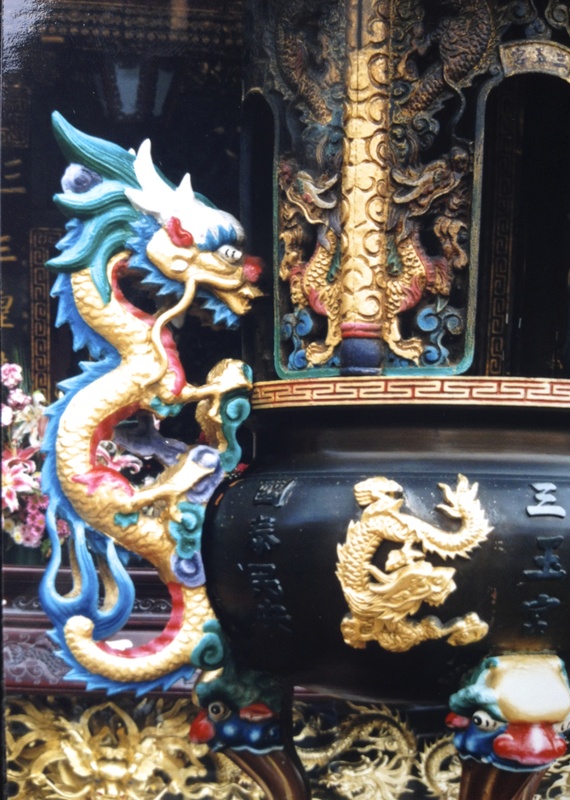 If you look for symbolism in numbers, like I do, it was a complete 12-year cycle of the Chinese Zodiac calendar. 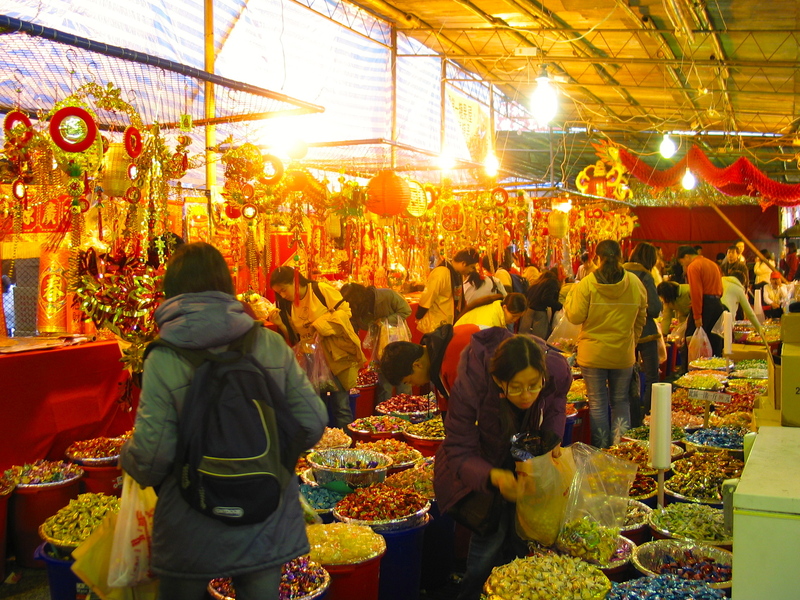 Twelve Chinese New Years celebrated traditionally with red envelopes and NT [New Taiwan] dollars, deafening strings of firecrackers, and an annual assortment of snacks from the market on Dihua Jie. 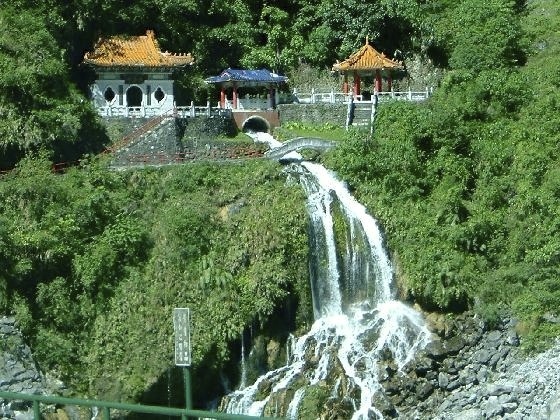 In our Tien Mu neighborhood, we ate in local restaurants that served delicious, and always freshly made, Chinese food. Still, you signed off on ambience while dining out for taste. Formica tables, plastic stools, plates and bowls, disposable chopsticks with splintery ends, napkins the size of a piece of toilet paper, and strong fluorescent lighting were standard dining décor. It was a good way to get the eating chore done, which we often did in our favorite haunts. But it was far from cozy. Desire breeds creativity so we found another way of eating with excellent menus in ambient surroundings. Familiar friends in conversation around a candlelit table set with pottery plates, gleaming silverware and tall stemmed wine glasses became an almost-every-weekend pleasure. It was regular “dining-out” that happened to be in each other’s homes. Sourcing ingredients was an adventure in foraging. 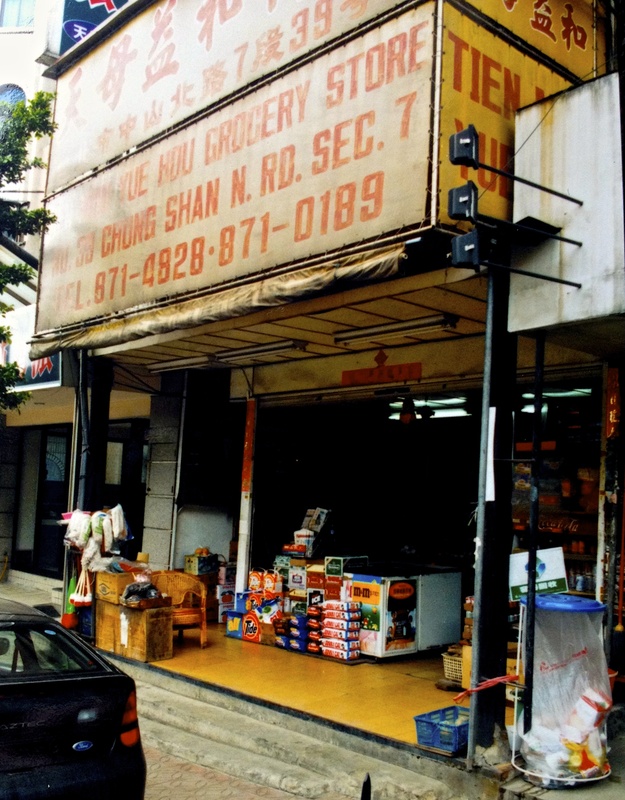 There was one grocery store with more than two aisles, which we fondly referred to it as “Two L Wellcome”, as that was the spelling. Otherwise, there were tiny mom-and-pop shops, where the nuances of supply, demand, and restocking necessitated flexible planning. There were several men among our group of friends who enjoyed preparing party meals. One of them was Alec. He inspired my husband to start cooking and our own dinner parties became more elaborate over the years. Fortunately, Mark adopted Alec’s kitchen-to-table outcomes rather than his in the kitchen methodology. Which tended towards the euphemistic “bull in a china shop”. It’s a fact that Alec operates on a very high metabolism. He prowls the kitchen after midnight to down a bowl [or two] of cereal for hunger pangs in the wee hours. He bikes up mountains and through forests, he jogs, he talks quickly, and moves fast, always. He makes us laugh when he pours coffee into his shirt pocket instead of his mouth or re-arranges pictures by knocking them off the wall. Luckily for his wife, he is the designated chef for their family by mutual choice. He nurtures both family and friends this way—with delicious home-cooked food. He not only cooks and bakes, he makes his own jams and condiments. For several years, he brewed fruity varieties of brandied liqueur and tried very hard to make us love them. There were annual gifts of syrupy sweet alcohol and floating fruit. Our appreciation never really ripened. We finally had to tell him we didn’t know what to do with the growing collection of unopened bottles. 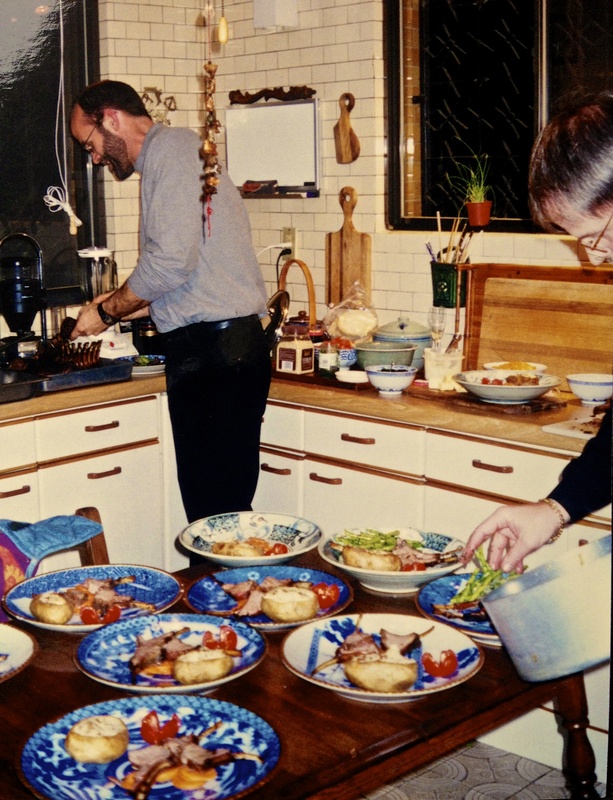 At times, Alec and Mark teamed up for a special celebratory dinner in our home. We had a good-sized kitchen, but I learned to stay out of it during prep time. Unpleasant noises mixed with exclamations of “Oh no!” were the norm. When Alec was sous chef, things shattered on the floor and crunched underfoot. Over the years, the kitchen table was reworked with a series of distressing gouges and missing wedges of wood. Guests were mostly unaware and always charmed by the cuisine. The table was designated firewood by the time we left Taiwan. When Alec is wrestling with ingredients in a kitchen, mishaps happen. The first dinner party in their apartment foreshadowed the eventual doom of our table. We just didn’t know it at the time. Six or eight of us were chatting amiably while final preparations were underway behind the kitchen door. A loud metallic crash followed by a muffled wail stopped conversation. Splayed out on the green marble tiles was an enormous kettle of just combined spaghetti and basil pesto. It was a vivid image of green and white on green and white, with a touch of barely repressed laughter. Using the well-known culinary 10-second rule, there was hurried scooping, wiping and reheating. Flustered nervous systems settled. Table-side, we murmured gratefully over the best pesto-pasta that ever shined a Hualien-marble floor. 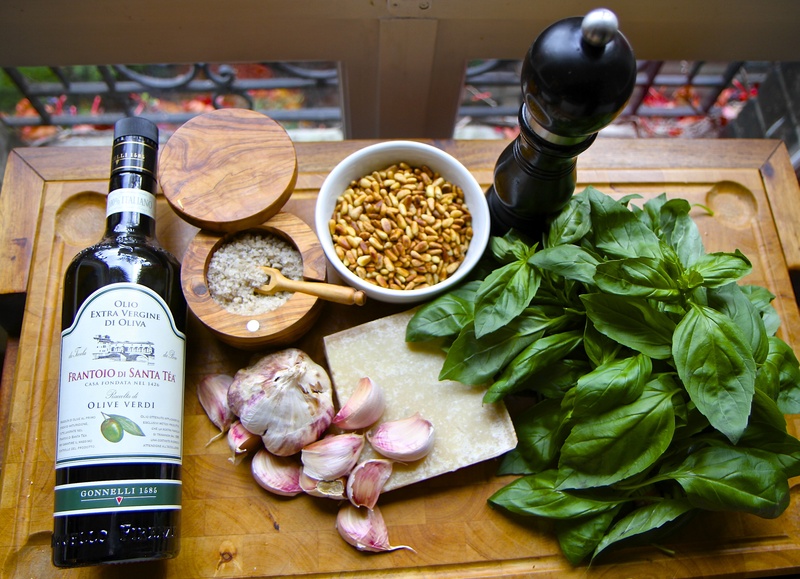 My all-time favorite recipe of Alec’s, and certainly the most memorable, is his version of homemade pesto. 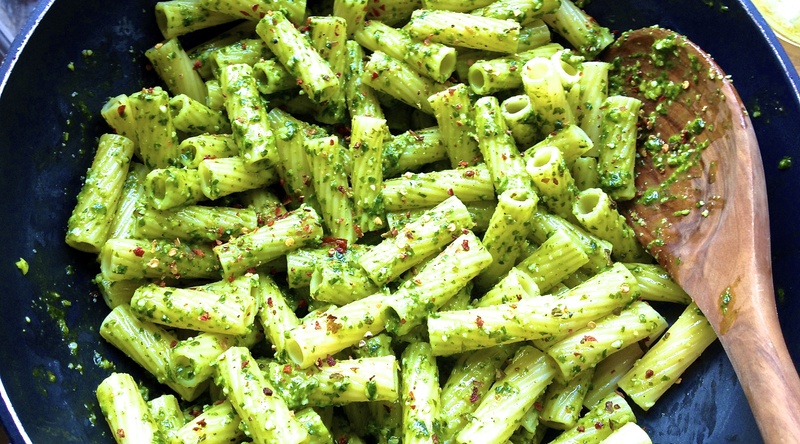 Served immediately on hot pasta, it is a garlicky, basil-y, olive oily sensation. Each time we were invited to dinner, I secretly hoped it was on the menu. Because basil was inexpensive and available year round in Taiwan, it often was. 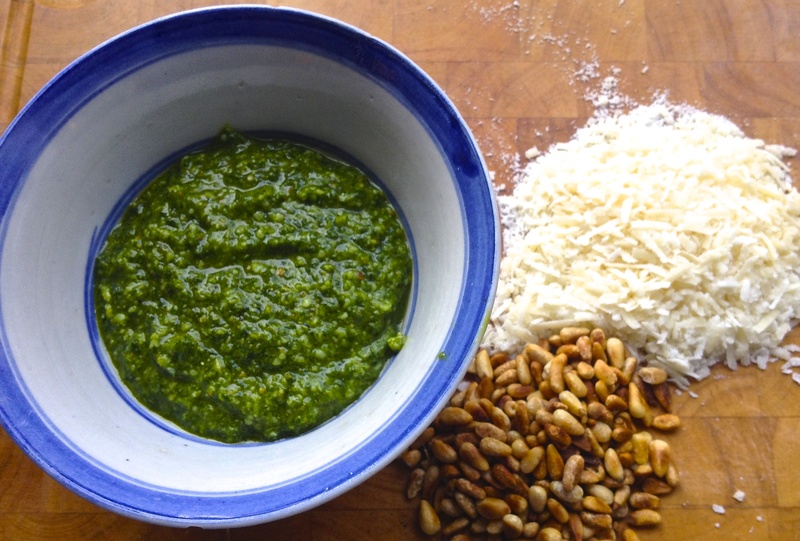 There are several advantages to making your own pesto. It’s super easy and very versatile. Aside from pasta, it can be stuffed into chicken breasts or sandwiches, used as a dip, or as an incredible base sauce for homemade pizza. It’s only optional whether you use it to polish the kitchen floor. Blend ingredients in food processor until smooth. Taste and adjust S&P. Dilute with a bit of hot water to mix easily with prepared pasta. Delicious on it’s own or add cooked chicken, sun dried tomatoes, artichoke hearts, black olives, even roasted butternut squash! Chopped cherry tomatoes make a colorful garnish. Recipe is sufficient for up to two pounds [1000 gm] of pasta. 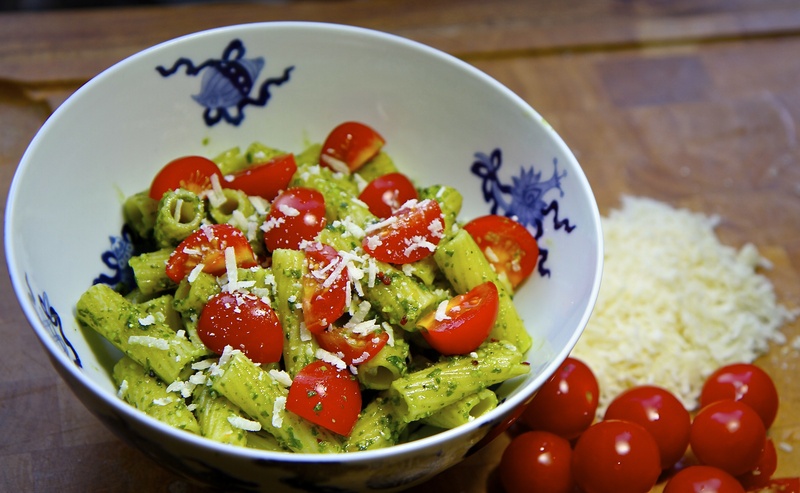 Adjust pesto amount to your taste. I tend to go on the lighter side when adding other ingredients. Store any extra in airtight container, with a thin film of oil. 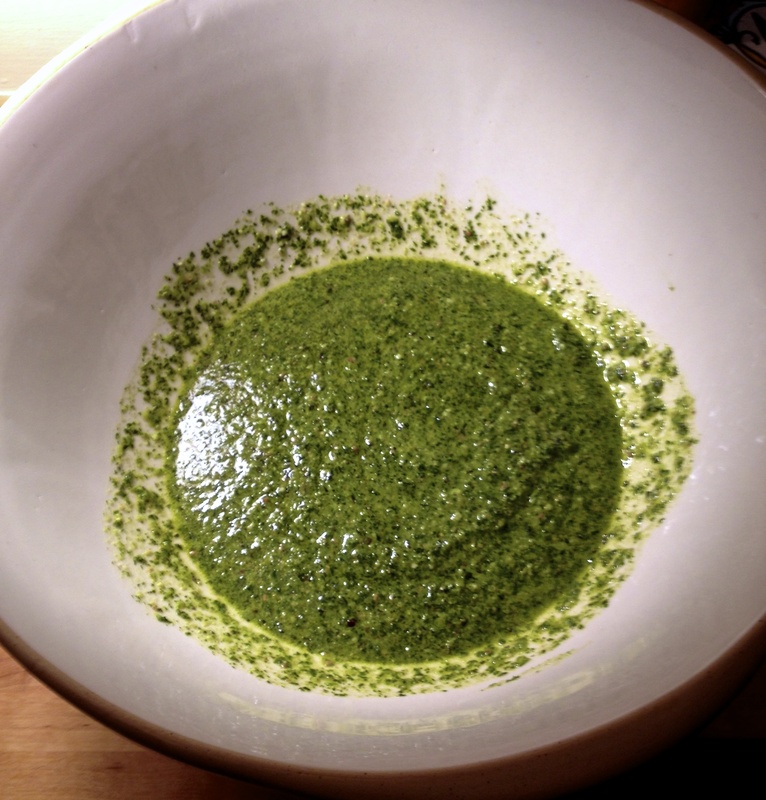 I have also made pesto à la Alice Waters [Chez Panisse] using only a mortar and pestle. This is a labor of love, and meditation, with a uniquely wonderful result. For pesto purists. Or those without food processors. Finally, the kitchen is clean after the Thanksgiving weekend eating fest, and I have time to put my feet up and do some catch up reading. 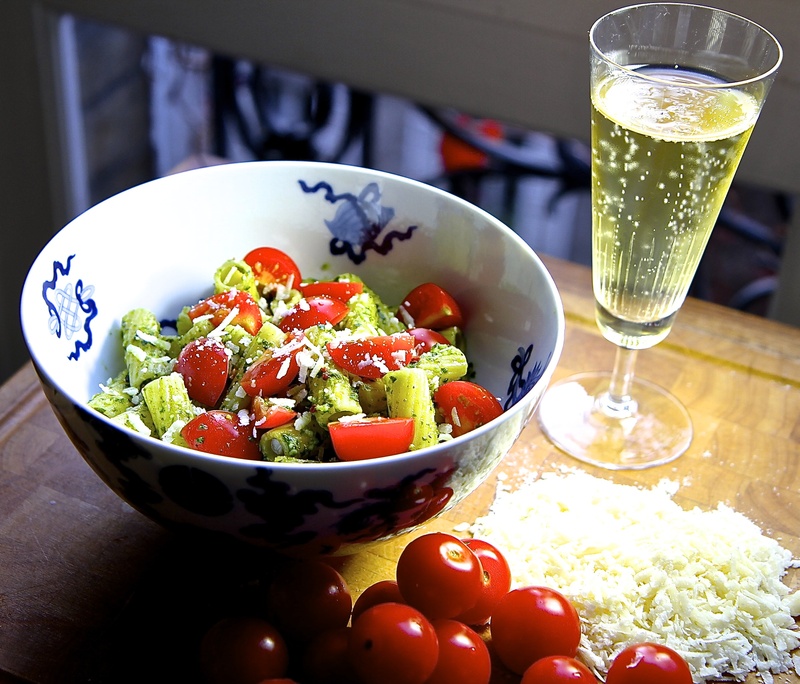 Your blog hit the spot, no turkey was necessary just a beautiful pesto. 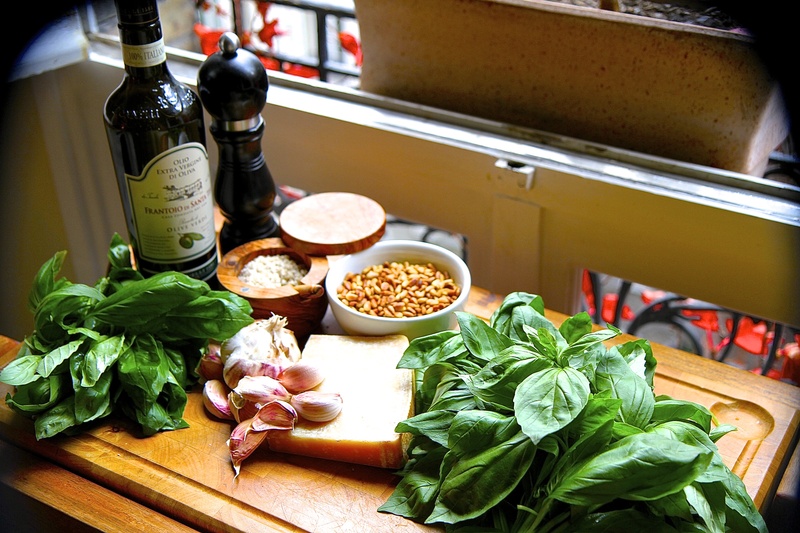 Your photos are fantastic, I could almost smell the basil. Thank you Sally! We shared the holiday dinner with my other Sally friend who led the Camino hike last May. Again, what wonderful descriptions and pictures. I love these and look forward to the next. I will never experience the marvelous places and experiences you have lived, but enjoy these posts. You have such a wonderful verbal and pictorial display of the things around you. I’m serious when I say you need to write a book!!! Thank you for sharing, Wendy. I loved the connection between the gorgeous marble floor and the pesto. 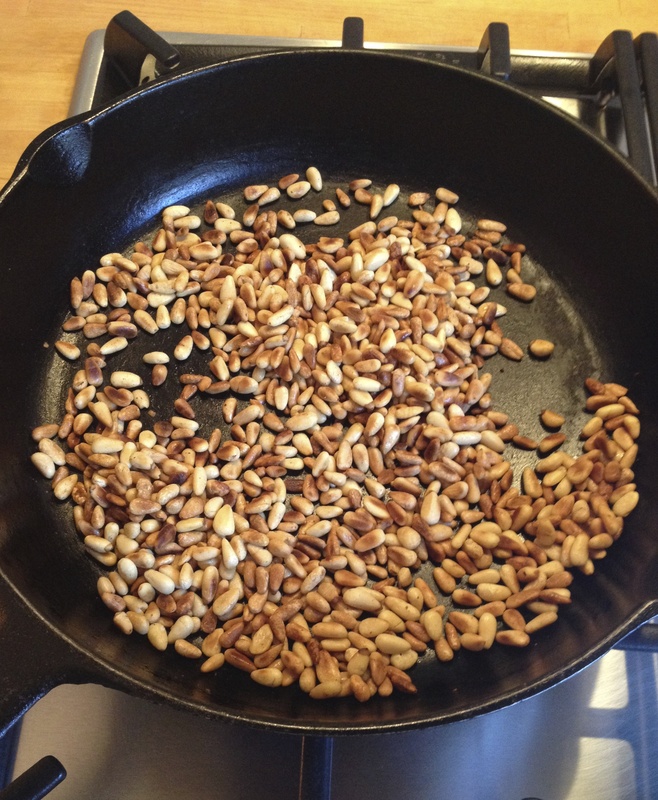 I will save this recipe (not the one that it is labor of love, however). 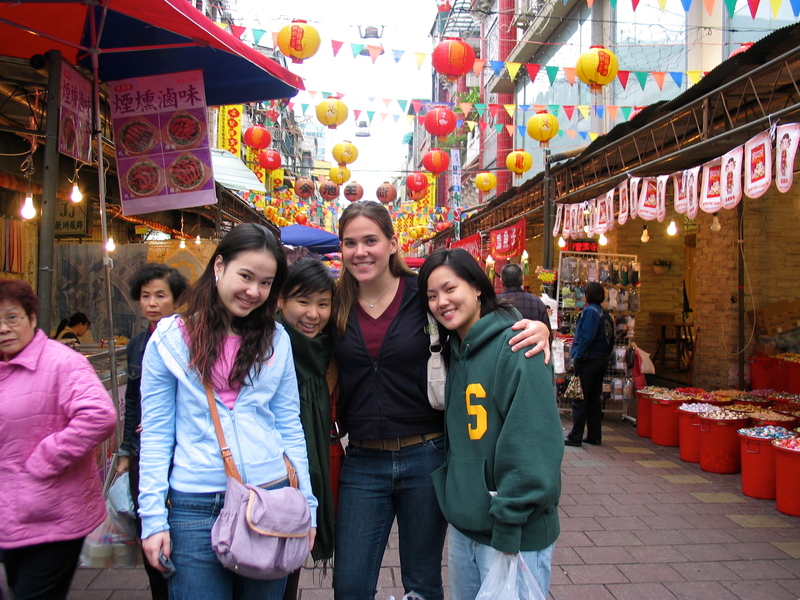 I also enjoyed learning more about your life in Taiwan. Clearly you embraced the local culture as you did in Frankfurt and now Paris. I wish you and Mark and your family a joyous holiday season. Hey, Lisa–happy upcoming holidays to you and John. And, yes, it’s true that we embrace so much from the cultures where we live because “home” is wherever we are. Another great post, Wendy. This one provided a real laugh-out-loud moment, which is great, because a veritable mountain of clean-up awaits me from last night’s Thanksgiving feast at my home…. Elizabeth, Happy Post-Thanksgiving! I know it would have been a delectable feast chez toi. Thanks for providing another lovely break in my day, taking me to lands unknown and food to be envied!